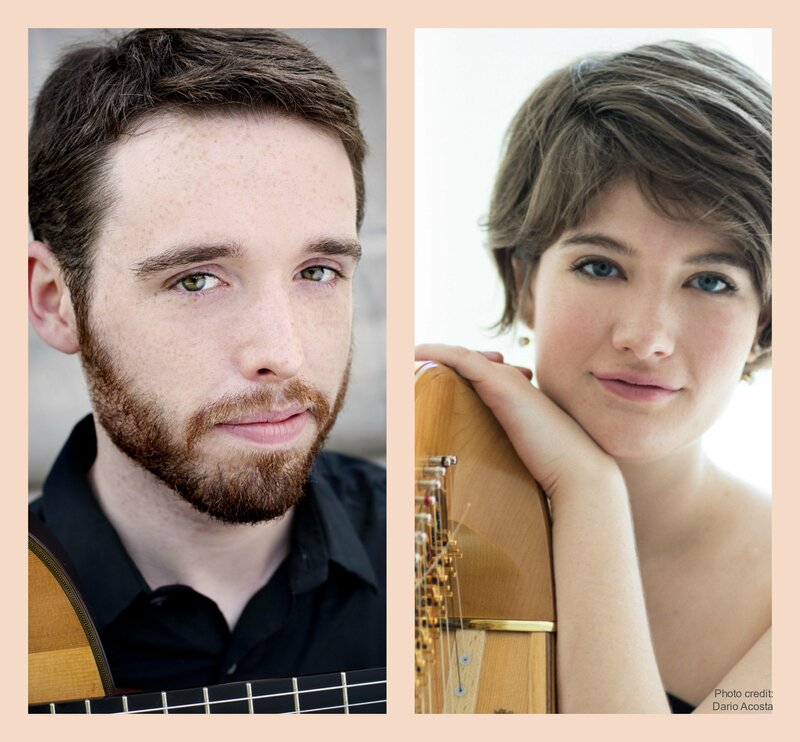 Fine Arts Chamber Players is pleased to present guitarist Colin Davin, faculty member at the Cleveland Institute of Music, and Emily Levin, principal harp of the Dallas Symphony Orchestra, on stage Saturday, November 11, for a free Bancroft Family Concert. Ms. Levin and Mr. Davin will perform music by Philip Glass, Maurice Ravel, Dylan Mattingly, and Manuel de Falla arranged for their instruments. Mr. Davin holds numerous prizes in international competitions, including the Guitar Foundation of America International Solo Competition. Regular FACP concert attendees will remember that Ms. Levin opened the 2016-2017 Bancroft Family Concert season with the Dallas Harp Quartet. She also has earned extensive professional awards and accolades, including Bronze Medal of the 9th USA International Harp Competition. Held in the Horchow Auditorium at the Dallas Museum of Art (1717 N. Harwood Street, Dallas 75201), the Saturday program begins at 3 p.m. with doors opening at 2:30 p.m. As always, the concert is FREE TO THE PUBLIC with no tickets required. Families with children are welcome. For more information, please visit our FAQ page or call 214-520-2219. In addition to their concert, Mr. Davin and Ms. Levin coordinated with FACP to perform for students in the instrumental programs at Dallas ISD’s W.E. Greiner Exploratory Arts Academy. The duo will play an excerpt from the Bancroft program, and will visit with the music students as well. 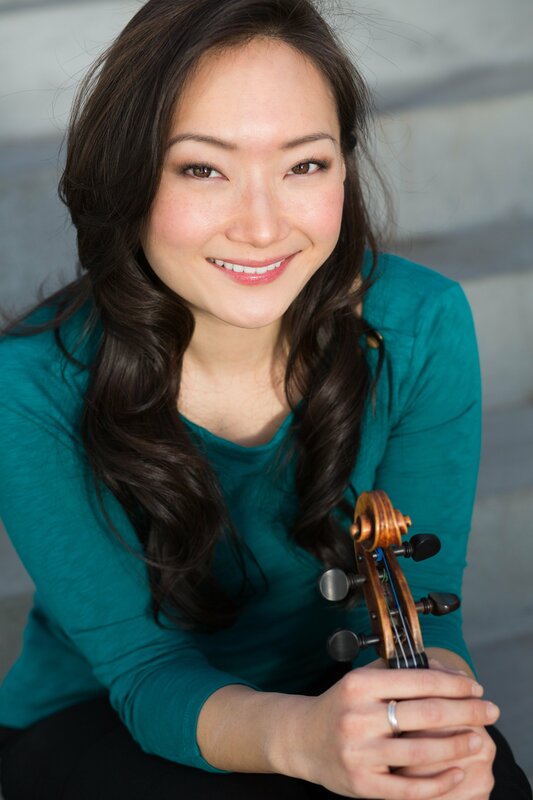 Eunice Keem is the Associate Concertmaster of the Dallas Symphony Orchestra, a position she’s held since 2014. Ms. Keem was the driving force along with FACP Artistic Director Rogene Russell in putting together the Bancroft Family Concert series season opener on October 14. Was there one piece on the program that you especially wanted to perform, or were you equally interested in all three (Szell, Strauss, Piazzolla)? I definitely wanted to perform the Strauss and Piazzolla – the Szell was suggested to me by Rogene. I had no idea it existed until recently! 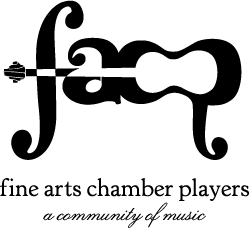 Why was a Fine Arts Chamber Player concert the place to perform the pieces? I feel like it is the ideal situation for a chamber music concert – presenting the lesser known works, in addition to more popular pieces, to an audience who is open and perceptive to experiencing them is always fulfilling for a musician. How old were you when you started playing violin? I started playing violin when I was 4. It was technically chosen for me – I received it as a gift for my third birthday. Actually, I didn’t know what a violin was; I was just enamored by the little black violin case wrapped with such a huge shiny red bow (I guess one could say I am a sucker for packaging!). I also played piano briefly for a few years, as well as flute for very short period of time. Violin was the one that really stuck! What type of music did you listen to as a kid, and what do you listen to now? I grew up listening to mostly classical music – my family always had the classical radio station on in the mornings. I first started branching out in my teens, and listened to a whole slew of genres. These days, I enjoy most kinds of music. The only genre I am not terribly keen on is country. Am I allowed to say that in Texas? It’s not unusual to hear of humorous stereotypes for certain musicians and their instruments in an orchestra. What’s a typical violinist like? According to others, violinists apparently are: self-centered, perfectionist, neurotic divas who always leave their practice door open just a little bit so everyone can hear how brilliantly and virtuosically they are playing (I can’t take credit for this line: thanks to “Toby Appel’s Irreverent Guide to the Orchestra”). However, I’d like to think we are simply musicians who care a whole lot about what they are playing and sound like! Who’s your favorite composer to listen to? To play? It’s impossible to name just one! They all provoke such different experiences, both as a listener and a player. Of course, Bach is always a winner. Cleanses both the ears and the soul, and I find it so wonderful for centering and keeping oneself in playing shape. What advice would you give 14-year-old Eunice? For 14-year-old Eunice, I would have given two pieces of advice: (1) Ask this question in times of insecurity (it’s an oldie but goodie) – what would you do if you weren’t afraid? (2) If what you have been doing so far is not working for you, it might be time to consider trying something different. You’ll make a whole new set of mistakes in the process – which often ends up being a good thing! What advice would you give a high schooler who wants to pursue music in college? Besides working and practicing as hard as you possibly can, expose yourself to as many different musical experiences as possible. Play as much chamber music as you can (all different groups), participate in orchestra, attend all kinds of concerts, and not just the ones for your instrument! Travel, if at all possible. It doesn’t mean having to spend lots of money on lavish trips, but getting as much exposure as you can to different cultures and languages and experiences will enrich one’s soul as well as their music making. And finally, I do strongly believe it is always good to have a long-term goal in mind. However, keep an eye on the process of how you will get there. Oftentimes, that will lead to doors opening in other amazing directions you may not have anticipated.